We've broken down some smart jewelry storage tips to help you make the most of your prized fine jewelry collection. Keep these ideas in mind the next time you need to store your valuable necklaces and rings. Don't store your jewelry in a drafty cold closet or a hot and stuffy attic. Store your jewelry at room temperature out of direct sunlight. Pick a location that maintains a consistent low humidity to help prevent premature tarnishing and discoloration. Different types of jewelry are most susceptible to damage from temperature and humidity than others. Opals and cameos require more moisture in the air to help prevent cracking and crazing. There are a lot of hard plastic and wooden jewelry organizers out there, but for fine jewelry, find something that has a soft fabric lining. This way if you drop your jewelry in quickly at the end of the day, you won't risk damaging your gemstones or metal. Make sure the jewelry box you choose has enough spots to store all of your jewelry without being clumped together. Clumps of jewelry are such a nightmare to sort through. This tip is for all jewelry but especially for costume, silver, and gold-filled jewelry. The last thing you want to do is store a green corroded piece of copper jewelry you got at a garage sale with your grandmother's prized locket. Not only could this musty, corroded smell transfer to your other jewelry, it may make your other jewelry tarnish faster, and even become corroded as well. 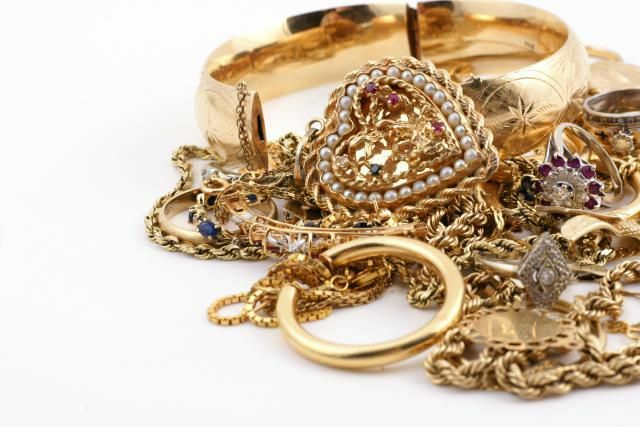 Even if your jewelry is clean, if you throw it in a dirty, dusty metal box, chances are your jewelry is going to pick up the smells and dinginess of its surroundings. Vacuum out your jewelry box, and be sure the environment is clean, dry, and smelling fresh. Most jewelry armoires have doors on either side that have hooks for hanging necklaces on. It is important that you keep your necklaces hung vertically to help prevent kinking and knotting. If you don't have a jewelry armoire, try a DIY solution. Take an old frame and add a cork board. Use push-pins for the "hooks" to hang your necklaces and tennis bracelets on. If you decide to use a jewelry stand, be sure the stand is tall enough so your necklaces don't touch the ground. Diamonds rank 10 on the Mohs scale making it the hardest gemstone on the market. What that means is that diamonds are capable of scratching any material that ranks lower on the Mohs scale. The same concept applies to other gemstones. You want to make sure your sapphires, that rank 9 on the Mohs scale, are stored away from both diamonds and any other material that ranks below it. Simply put: your gemstone jewelry should not be stacked in big piles in a drawer, but rather neatly and securely placed in a tray or other separator like an individual zip lock bag. The most important consideration when trying to prevent silver jewelry from tarnishing is keeping the jewelry dry and away from other tarnishing jewelry. Silver jewelry isn't terribly expensive, so sometimes being resourceful is your best option here. Loosely wrap your cleaned, silver jewelry so that there is some airflow but the jewelry is protected. Store this jewelry neatly in a drawer with a couple of those silica packets you get when you buy a pair of shoes. If you are feeling crafty, you can use felt or cotton and sew little pouches so you can quickly open them up to see what is inside. Sometimes, it is hard to store your jewelry to prevent damage and also prevent theft. On the one hand, you want to store your jewelry in an appropriate, dry, organized place, but on the other, you want it hidden in a secure safe. Choose your most valuable items and organize those on velvet lined drawers within a locked, inconspicuous location. For all your valuable jewelry, make sure it is insured with jewelry insurance.